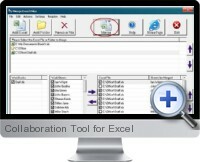 The Collaboration Tool for Excel (MergeExcel) enables managers and analysts to work with Excel data collaboratively through a unique consolidation and export engine. The Collaboration Tool for Excel essentially allows to merge multiple Excel documents in order to analyze and optionally edit the data in a pivot table style type view. Modified data can then be exported out as separate spreadsheets. This approach is ideal for managing collaborative work by recuperating data and communicating back to participants within a project or organization. The Collaboration Tool for Excel can also be used for resource and process management such as understanding what employees are working on, how funds are spent and what resources are required to meet end results. Analyze plans and working results of associates. An example work flow involves sending out identical Excel documents to participants, asking them to fill it in and combine the ready documents in the Collaboration Tool. The next step consists of working with the united data. Analysis can be carried out, adding comments or changing the data. The Collaboration Tool for Excel allows to save changes in initial documents which can be returned to employees for further work. The united document can also be saved as a separate file.